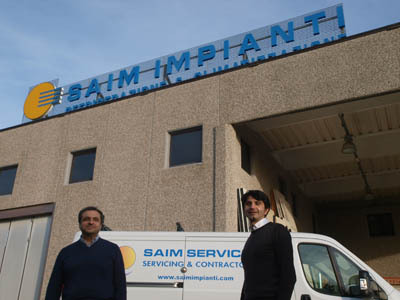 ... starts in 1988 in Fondi (LT), when Raffaele Simonelli, having already acquired experience in installing refrigeration units, ventured out to create his own firm, SAIM. In 2000, his brother Yuri joined the effort and SAIM IMPIANTI snc. was founded. The professionalism that they have applied in all aspects of their efforts allowed them to quickly become a leader in its field. The MOF (Mercato Ortofrutticolo di Fondi) was growing and becoming on of the major logistical nodes in the distribution of produce in Italy and abroad. The Simonelli brothers could appreciate the opportunity at hand and worked tirelessly to become the main provider of refrigeration and air conditioning service to local operators. The desire to grow and improve has brought them to widen their horizons. The initial field of focus expanded. Research and development brings leading-edge technologies, applied in useful manners. The range of applications also extends from produce to aspects that directly impact on health and well-being.